This review originally appeared in the online version of FREE! Magazine March 2009. Used with permission. The one thing that I find difficult when it comes to reviewing a new album is the fact that there’s usually not enough time to really make any proper judgments. Initial reviews of an album can feel rushed and just skim the surface of what only time spent living with that album can reveal. So here comes U2’s latest release, No Line on The Horizon, an album that almost demands repeated listening to fully appreciate its depth and nuance. 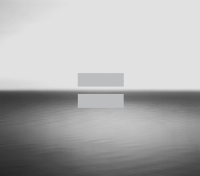 No Line on The Horizon is U2’s 12th studio release and catches the band at a bit of a crossroads. Trying to venture forth from the relative safety of their “back-to-basics” approach to song writing of their last two albums, the band is once again in search of a new sound while at the same time trying to retain the core of what makes them quintessentially U2. After scrapping their recording sessions with producer Rick Rubin (whose hands-off style probably didn’t fit well with their new experimental direction), the band enlisted the help of long-time collaborators Brian Eno and Daniel Lanois. This new album - a product of the band’s jam sessions in Fez, Morocco with Eno and Lanois (who share co-writing credits) - chronicles their journey. For much of the album, the band has abandoned traditional song structures and have opted instead to create sonic landscapes and textures grounded by Adam Clayton’s tasteful but driving bass lines. The album mixes Rock, electronica, Jimmy Page-esque guitar riffs, and ambient music along with some Arabic influences thrown in for good measure. There are more immediate and accessible songs (including the campy “Get On Your Boots” and “Stand Up Comedy”) thrust in the middle of No Line on the Horizon, but they almost serve as a counterpoint to the album’s more experimental side. These less accessible songs however, (which include “Fez-Being Born”, “White as Snow”, and “Cedars of Lebanon”), are really the heart of the album; drawing the listener in further each time they’re heard. No Line on The Horizon is at times somber and contemplative (but never boring) with more than enough compelling moments to make it a journey well worth taking. U2 will hit the road this year in support of the new album, playing 19 stadium dates in Europe (closest Finland show is Gothenburg, Sweden) followed by more dates in North America in the Fall.